This paper analyzes the spatial and temporal distribution of CO2 emissions intensity and energy intensity in China by using spatial measuring method from 2000 to 2013 and estimates the potential for CO2 emissions reduction. The results obtained in this study include: (1) Both CO2 emissions intensity and energy intensity are declining; (2) the spatial distribution of carbon emission intensity and energy intensity in China shows the characteristics of lower from north to south; (3) China’s total growth of energy consumption and carbon emissions is clearly slowing, which will peak before 2030; the carbon emission reduction potential in China is great with 167,316.91 million tons, and Shanxi, Inner Mongolia and Hebei have the greatest potential to reduce CO2 emissions with 29,885.8 Mt, 32,704.49 Mt and 34,222.1 Mt, respectively; (4) the differences of CO2 emissions intensity and energy intensity among provinces are distinctive. This study can provide a reference for the sustainable development of China’s energy and environment. Economic development is dependent with the energy consumption; furthermore, the energy consumption will give rise to the increment of CO2 emissions. According to the “5th Assessment Report of the Inter-governmental Panel on Climate Change (IPCC),” the atmospheric concentration of CO2 had risen to 391 mg/L by 2011, which were 40% increase over the figures before industrialization. The latest 30 years, that is, from 1983 to 2012 may be the hottest decades in the past 1400 years (IPCC 2014). As global warming has become one of the most serious environmental problems worldwide, issues related to carbon dioxide (CO2) emissions have attracted close attention in the worldwide (Li et al. 2015). Meanwhile, China has surpassed the USA in CO2 emissions in 2008, having become the world’s largest emitter and energy consumer which makes China face more and more pressures on the control of its CO2 emissions (BP 2013; Zhu et al. 2010; Hu and Lee 2008; Li 2010; Wang and Waston 2010). At the Copenhagen Climate Change Conference in December 2009, China was pledged to reduce its CO2 intensity by 40–45% by 2020, based on 2004 emission levels. In 2013, at the Third Plenary Session of the 18th Central Committee of the Communist Party in China, the issue of ecological civilization construction was addressed. In 2014, the Joint Statement on the Sino-U.S. Climate Change Statement, in which Chinese government promised to reach the CO2 emission peak around 2030, and by then, its CO2 emissions will be reduced by 60–65%. All of these indicate the coordination between economic growth and environmental protection in China has been paid high attention by the central government (Zhao et al. 2016). Therefore, precise evaluation of the CO2 intensity as well as energy intensity that occurs in China or other countries is a matter of serious concern. Many researchers have conducted the study of the relationship among the carbon intensity, energy intensity and economic growth. Some authors applied adaptive weighted division rolling based on year index specification to total carbon emissions from the manufacturing sector of 10 OECD countries during 1971–1991 and found that declines in aggregate carbon intensity for these countries may be primarily attribute to decreases in energy intensity (Greening et al. 1998, 1999, 2001, 2004). The evolution of carbon emissions from the IEA’s manufacturing sectors in 13 countries has been concerned, and the lower emissions of manufacturing in most countries resulted from lower branch energy intensity as well as changes in utility fuel mix (Schipper et al. 2001). Energy intensity and structural effect were the two major influencing factors on emission intensity in African countries (Ebohon and Ikeme 2006). In addition, a log-mean Divisia index decomposition approach has been employed for seeking the driving factors of emissions related to energy and other industrial activities, and then the authors concluded that the emission intensity has reduced significantly in both energy-related activities and other processes at the aggregate level (Bhattacharyya 2010). For the USA, the relation between energy consumption, the GNP and the output of carbon emissions has been further studied and the investigation indicated that income did not granger-cause carbon emissions in the USA in the long run, but energy use did. Hence, income growth by itself may not become a solution to environmental problems (Eden and Hwang 1984; Soytas et al. 2007). As for this paper, the relationship among energy, CO2 emissions and the economic growth is analyzed from temporal and spatial perspective by ArcGIS software. Additionally, the potential of CO2 emissions is proposed in this paper. The remainder of this paper is arranged as follows: the calculation method of energy intensity and CO2 intensity is present in Sects. 2. Section 3 elaborates the temporal and spatial characteristics of energy intensity and CO2 intensity according to the calculation; the specified discussion about the results is shown in Sect. 4. Section 5 concludes and makes suggestions. In this paper, carbon intensity and energy intensity are employed as the research indexes. Carbon intensity refers to the amount of carbon dioxide emitted of per unit GDP which shows that the lower the CO2 intensity, the less CO2 emissions per unit of GDP, while energy intensity is the amount of energy consumed of unit GDP which indicates that the lower the energy intensity, the less energy consumed per unit of GDP. Because there were studies, which have shown that energy consumption and economic growth are the long-run causes for CO2 emissions, and CO2 emissions and economic growth are the long-run causes for energy consumption (Wang et al. 2011), it is reasonable to choose the two indexes to reveal the relation among CO2 emissions, energy consumption and economic growth. Meanwhile, the paper adopts the spatial measuring method to analyze the carbon intensity and energy intensity in China from temporal and spatial perspective. In Eq. (1), Ci represents the carbon emissions caused by i energy, Ei represents the consumption of i energy, and EFi represents the carbon emissions coefficient of i energy. The values of related parameters are shown in Table 1. In Eq. (2), C represents carbon emission in the production process, Qi represents the production volume of a product for i province, and Ei refers to the carbon emission coefficient in the production process. In Eq. (3), ECi is the intensity of carbon emission for i province, Ci denotes total carbon emission in i province, and Gi represents GDP for i province. Energy intensity is the energy consumed per unit of GDP, and energy intensity is an important index of economic development. The lower the energy intensity, the healthier the economy. The higher the intensity of energy consumption, the more energy that is needed to produce the same GDP, which is in violation of realizing green and sustainable economic development. In Eq. (4), EEi means energy intensity for i province, Ei means total energy consumption in i province, and Gi represents GDP for i province. In formula (5), PEij means the potential of CO2 emissions reduction in j year for i province (municipality), Gij is the value of GDP in j year for i province, ECij means the carbon intensity in j year for i province (municipality), and Fj is the j year’s carbon intensity in China. This paper focuses on 30 provinces and regions in China which include 21 provinces, 4 municipalities and 5 autonomous regions, and then collects the GDP, energy consumption, population and other relevant data for these regions. (Taiwan, Macao, Hong Kong and Tibet are excluded due to the lack of relevant data.) 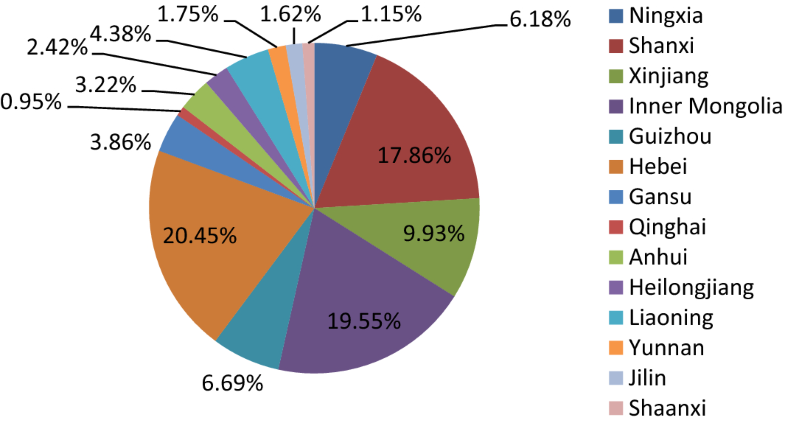 The data of energy that includes coal, oil, gas and other energy consumption of provinces are from the China energy statistical yearbook (2010–2015). In addition, the coefficient of carbon emissions is from the National Greenhouse Gas Inventory Guide (IPCC 2006) and the GDP in various provinces comes from the China statistical yearbook (2008–2015). This paper studies the characteristics of carbon emissions intensity and energy intensity for provincial scale in China from the temporal and spatial perspective, compares the differences of energy intensity and carbon intensity in provinces and then makes a prediction about the potential of CO2 emissions reduction in China. However, there are some limitations, such as the lack of data in some provinces, which are not included in this study. By the analysis of spatial measuring method for Chinese provinces, the evolution feature of carbon intensity and energy intensity in China is obtained from temporal and special viewpoint, respectively. The carbon intensity and energy intensity are decreasing as shown in Fig. 1. In 2000–2013, China’s carbon intensity gradually decreased from 3.15 tons/104 yuan RMB to 1.50 tons/104 yuan RMB with 0.127 tons/104 yuan RMB annual averagely. Moreover, energy intensity decreased from 1.55 tons/104 yuan RMB in 2000 to 0.73 tons/104 yuan RMB in 2013 with 0.063 tons/104 yuan RMB annual averagely. As can be seen in Fig. 2, from 2000 to 2013, the total amount of carbon emissions and energy consumption is on the rise, and growth rate is decreasing; it shows that GDP growth rate has exceeded the growth of energy consumption and carbon emissions. The trend of the carbon intensity and the energy intensity is similar as can be seen in Fig. 1. The reason is that energy structures, technological levels, climate characteristics and other possible conditions nationally are ignored. The change trend of the total amount of energy consumption and CO2 emissions in Fig. 2 is also roughly consistent, and there is a significant declination in energy consumption and CO2 emissions. Since energy used is bound to produce CO2, their change tend is approximately similar. But the impact of energy combustion and energy structure can lead to inconsistent trends. There is a significant downward trend in the growth of energy consumption and carbon emissions, indicating that the potential for energy conservation and emission reduction in China is huge, and energy consumption and carbon emissions will reach its peak. It can be concluded that energy intensity presents the characteristics of lower from north to south in the spatial distribution. And the spatial distribution of energy intensity in the different provinces of China is obviously different. In 2000, the energy intensity of Guizhou, Ningxia and Shanxi was the highest followed by Qinghai. Then the following are the Xinjiang, Inner Mongolia, Liaoning, Jilin, Hebei, Heilongjiang, Guangxi and most of the central south region such as Jiangxi, Shandong, etc. The lowest energy intensity is the Hainan, Guangdong and Fujian as well as southeast coastal provinces. In 2005, the highest energy intensity was Ningxia, Qinghai and Shanxi. It still presents the spatial distribution characteristics of energy intensity of lower from north to south, and the energy intensity of the southeast coastal areas remains the lowest. While the energy intensity decreased in Zhejiang, Jiangsu and Shanghai, in 2008 the intensity of energy consumption still presents the characteristics of lower from north to south in the spatial distribution. And Qinghai, Ningxia, Shanxi and Guizhou have the relatively higher energy intensity. In 2013, the energy intensity of Guizhou, Qinghai, Ningxia Hui and Shanxi is decreased, and the most energy-intensive areas have changed into Guizhou and most northern regions except for Heilongjiang, Jilin and Liaoning. This shows that the trend of lower from north to south is more obvious, and the national energy intensity is further declining. Besides that, the trend for intensification of energy intensity in China is stronger and stronger. The southeast coast is a gathering area of low energy intensity, and the northwest region is becoming a gathering area of high-energy intensity. Furthermore, there is a significant decline in energy intensity from time to time. Overall, China’s overall energy consumption intensity shows a significant decline. The decline of Qinghai, Ningxia, Shanxi and Guizhou was the most significant. As can be seen in Fig. 4, the CO2 emissions intensity shows the characteristic of lower from north to south in the spatial distribution. And the areas with the highest carbon intensity in 2000 include Shanxi, Guizhou and Inner Mongolia, followed by Chongqing, Jilin, Liaoning, and the lowest is Hainan and Fujian. In 2005, it still showed the characteristics of lower from north to south. And the CO2 emissions intensity of Ningxia was the largest, while many provinces in China, especially in the northwest and southeast, have been declined significantly. The pattern of spatial distribution still appears in 2008, and the relative ranking of provinces has not changed too much. Furthermore, the spatial distribution of CO2 emissions intensity in 2013 has not changed much, while there is a downward trend in the intensity of CO2 emissions across the country, and the distribution of the north higher than south is more obvious. In addition, the intensity of carbon emission shows the characteristics of accumulation. The general characteristic is that the north is lower than the south and the north region is a gathering area of high CO2 emissions intensity and the south region is in converse situation. And it could be clearly to find that the amount of provinces with low CO2 emissions intensity is increasing from 2000 to 2013 which is in line with the reduction in China’s carbon intensity over time. In addition, China’s carbon intensity has dropped clearly from time to time, and Ningxia, Shanxi and Guizhou have made significant contributions. By ordering the energy intensity for various provinces in 2013 as shown in Table 2, it is concluded that the carbon intensity of Ningxia, Shanxi, the Xinjiang, Inner Mongolia, Guizhou Province, Hebei, Gansu, Qinghai, Anhui, Heilongjiang, Liaoning, Yunnan, Jilin and Shanghai is higher than the national average level. Therefore, these provinces are the focus of energy conservation and emission reduction. The potential for CO2 reduction for provinces is shown in Table 2. As can be seen from Tables 2 and 3, the potential of CO2 emissions reduction in China is great with 1673.17 million tons. And Fig. 5 clearly shows that Shanxi, Inner Mongolia and Hebei have the biggest potential for emission reduction with 298.86 million tons, 327.04 million tons and 342.22 million tons, respectively. From Fig. 6, it is obvious to find that the total CO2 emissions reduction potential of Shanxi, Inner Mongolia and Hebei takes up more than half of the national CO2 emissions reduction potential. Thus, these areas have a great potential to reduce emissions due to the industrial base or large amount of energy, especially coal resources. From Fig. 1, it is clear to learn that the change trend of energy intensity and carbon emissions intensity is roughly same from the national perspective. Furthermore, there are distinct differences in energy intensity and carbon intensity among different provinces in 2000, 2005, 2008 and 2013 by comparing Figs. 3 and 4 from the temporal development and spatial distribution that results in the different regional climate characteristics, energy structures and the technical conditions. Firstly, the climatic features can greatly influence the relationship between the energy intensity and the carbon intensity because of the climate in the northern region which needs more heat to withstand the cold, and the amount of heat dissipation is relatively more. Secondly, the availability of energy is different with the different areas, and the energy structure varies greatly. Different types of energy have different coefficients of CO2 emissions, which can affect energy intensity and emissions intensity. Finally, as for technical conditions, there are great differences in different regions due to the different development levels of economy and technology. When the area is developing fast, the technical conditions are relatively high and then the loss of heat can be reduced and make energy combustion more fully. It can also change the relationship between energy intensity and CO2 emissions intensity. 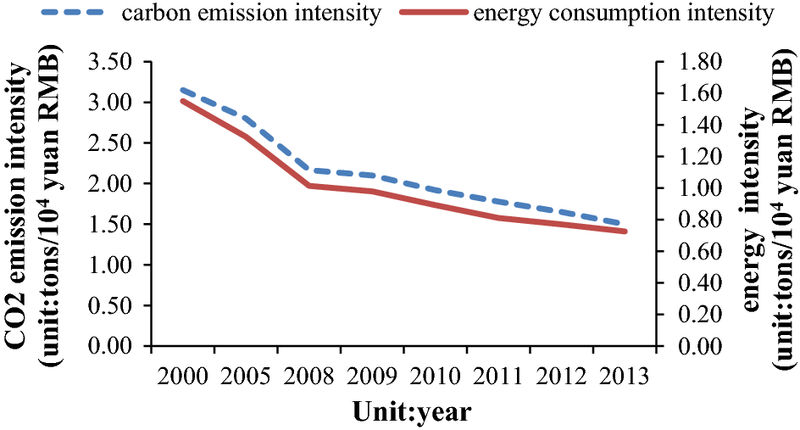 The carbon intensity and energy intensity in China are generally declining. The overall carbon emission intensity and energy intensity in China are broadly in line, which is in consistent with emissions from energy sources. The energy intensity and the intensity of carbon emissions in China indicate that the spatial characteristics of lower from north to south in CO2 emissions and energy consumption, and the spatial agglomeration for energy used and emissions is also revealed. The energy intensity and carbon emissions intensity for different provinces have great differences in temporal and spatial distribution characteristics, which lie in different climate characteristics, energy structure and the technical conditions. China still has great potential for energy conservation and carbon emission reduction. Due to the huge emission reduction potential in China, China should pay more attention to the energy conservation and emissions reduction resolutely. As long as reasonable measures are taken, the goal of energy conservation and emission reduction can be realized in China in order to sustainable and healthy economic development because the energy consumption and carbon emissions will gradually peak. Different regions should adopt different measures for energy conservation and emission reduction. For example, the areas having low technology should improve the conditions of technology; the energy mix should be adjusted in areas where energy structure is not reasonable; clean and renewable energy can be used in northwest China, such as geothermal, wind, solar, biomass, for sustainable development of energy. LC contributed to the data analysis and wrote the manuscript. XL conceived the framework of the paper. SX contributed to the design of the web survey and analysis of the data. LQ collected relevant data. MW submitted this manuscript to this journal as corresponding author. All authors read and approved the final manuscript. This research is supported by funding from Projects of the National Social Science Foundation of China (17BGL147).